The logo of the Type 3 & 4 Club. -I am 53, English born and bred, a school science teacher, living in Pensford, a small village on the A37 road about 5 miles south of Bristol. 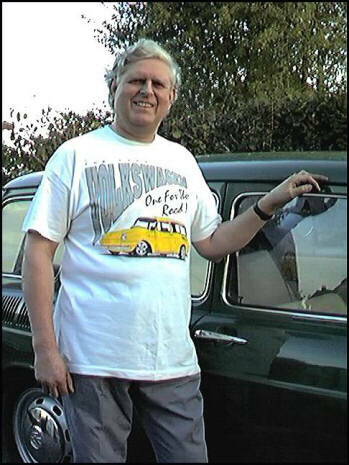 I have been writing the publications and doing many other jobs for the VW Type 3 & 4 Club for about 12 years, and have been keen on VWs for over 40 years. 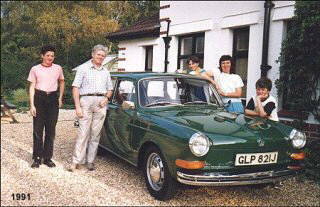 I still have the Beetle I bought when a student in 1966, but it needs some restoration work now. I have collected a useful library of VW Factory Manuals and information, mainly for the Type 3s. -The house in the Variant picture is not mine; I grew up there, and my mother still lives there. I would like the large garage there; it's big enough to take the Camper roof off and mend it without having to put either outside! 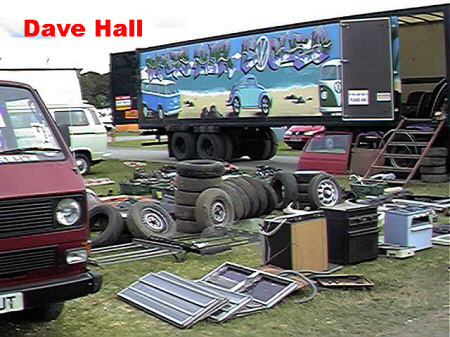 You can see I have varied interests, including building, but as far as VWs go, I have hardly driven anything else, and have never owned a non-VW. I took this picture few years ago with my family and the Variant. From left: Richard, Dave (me), Chris, Anne (my wife) and Steve. I haven't changed much since that picture, but my children are about a foot higher now. Here is the first picture that was received via Internet for the QUEST, Dave sent it and explained that this picture was taken in Canteburry, England. 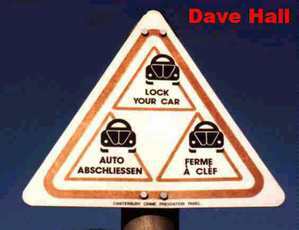 It shows a sign in a parklot, it is amazing to see that the VW Beetle image was used in England by the authorities. 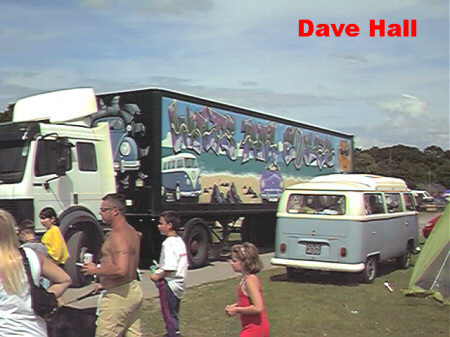 Dave also sent other pictures that can be seen in this site, as it is the case of the: Photo205.jpg and Photo206.jpg, that were taken at the British VW Festival this July (1999), and show the truck that WILTS AIR-COOLED drive to shows with their VW parts inside. They dismantle VWs. Wiltshire is an area in southern England. I thank very much to Dave and wish him much success with his Club.